A ground-breaking prostate surgery will be performed for the first time in Greater Manchester at Wrightington, Wigan and Leigh NHS Foundation Trust this month. 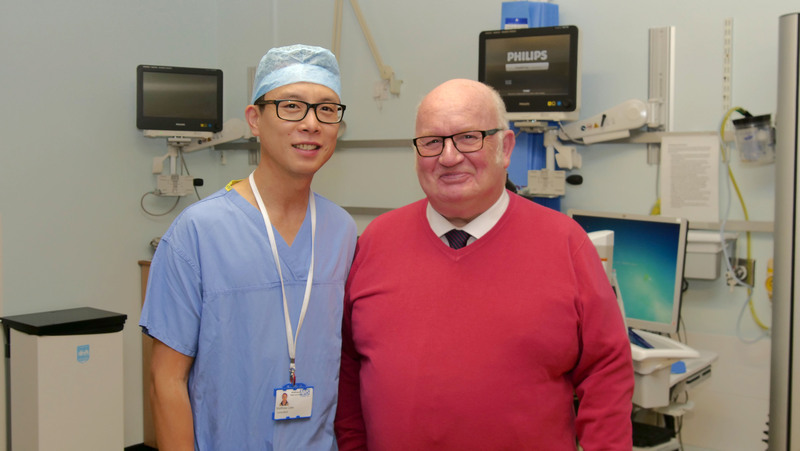 Urology Consultant, Mr Matthew Liew, will conduct the first Holmium Laser Enucleation of the Prostate (HoLEP) surgery on primary school teacher, Graham Royles, who is the first person in the county to undergo the operation. Mr Royles, from Abram, is hopeful that the procedure will change his life. Mr Liew said: “I feel that there is an unmet need in the region for patients suffering with the consequences of a significantly enlarged prostate. They may have to undergo multiple endoscopic surgeries, or need open surgery to treat the condition successfully. “HoLEP is an endoscopic procedure using high powered laser energy that has become well established worldwide for the past 20 years. Some of the advantages of undergoing a HoLEP procedure include reduced bleeding, better removal of obstruction and improved long term results when compared to the ‘current standard’ TURP (transurethral resection of prostate) operation. “Recent studies in the UK have shown that the HoLEP surgery can be performed as a day case, or overnight stay in over 70 per cent of cases* whereas our current hospital stay for TURP at WWL is around two days,” says Mr Liew. “There is also a subset of patients who have catheters for years due to reduced bladder contractions who may benefit and finally be catheter free. Mr Royles, said the surgery is going to have a marked impact on his life. He said: “Following the procedure, I’m hopeful that life will return to how it used to be. “I will hopefully no longer have to travel more with no stopping every 30 miles or so to avoid mishaps and will be able to go abroad without fearing queues on the aircraft. “I hope that my confidence will return and I’ll be able to meet with friends to enjoy a sociable evening. The surgery isn’t just going to have an impact on Graham’s life, but thousands of other people too. “Being able to perform this procedure at WWL will potentially have a huge impact on our patients,” says Mr Liew. I am very much interested in having this procedure, my prostate is very large and have had to have a catheter for two years. Mr Lawrence Clarke of Salford Royal Hospital has recommended the Holep procedure. Please consider me as a candidate for this operation.